MAG Industrial Automation Systems is a multi-national corporation consisting of 13 companies and brands in the manufacturing technology industry. Six are headquartered in the U.S, seven in Germany. 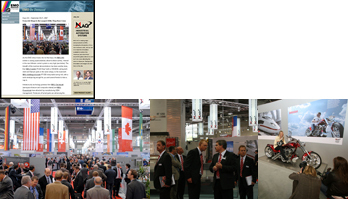 The industry-leading trade show in Europe is EMO, held in September. Many North America trade publication editors do not attend EMO. So we created a temporary website, updated daily, called “EMO on Demand” to keep these editors in the loop, and to speed the process of getting the word out via their publications and websites. Daily emails sent during the show prompted editors with links to the updated site. The breaking news, plus image files, background information, and a press kit of releases, were only a click away on the site. In addition to the customary mentions, MAG got priority coverage in five North American publications and three industry websites that previously had only given minimal attention to this European show. Requests from editors for editorial material from MAG also increased, especially related to their newly-introduced control-manufacturing division, Infimatic.